American architect and industrial designer, George Nelson was one of the founding fathers of American modernism together with Charles & Ray Eames. He designed much of the 20th century’s most iconic modernist furniture. George Nelson was born in 1908 in Hartford, Connecticut. He studied Architecture at Yale University, where he graduated at the age of 20 and in 1931, he also received a bachelor’s degree in fine arts. The following year, while preparing for the Paris competition, he won the Rome award. With Eliot Noyes, Charles Eames and Walter B. Ford, Nelson was part of a generation of architects who found too few projects and turned to the success of the product, graphic and interior design. During his life, he traveled through Europe, where he met a number of modernist pioneers, but was based in Rome. A few years later, he returned to the United States to devote himself to writing. In 1940, George Nelson had attracted popular attention with several innovative concepts. One of these innovative concepts was the “storagewall“, that attracted the attention of De Pree, who was the president of Herman Miller. 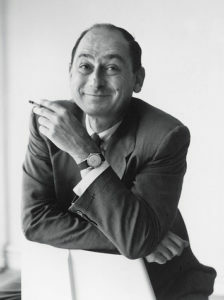 De Pree asked him to become director of design Herman Miller and this opened him a long series of successful collaborations with Ray and Charles Eames, Harry Bertoia, Richard Schultz and Donald Knorr. From his beginnings, its office has worked for and with the best of its time. It was undoubtedly the most articulated and one of the most eloquent voices on 20th-century design and architecture in the United States. He was a teacher and he did write extensively, organized conferences such as the legendary Aspen meetings and he also published several books. 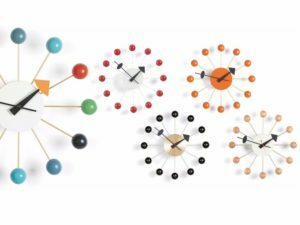 Among his best known projects, there are the marshmallow sofa, the coconut chair, the ball clock and many other products that have become milestones in the history of a profession that has contributed to shaping. 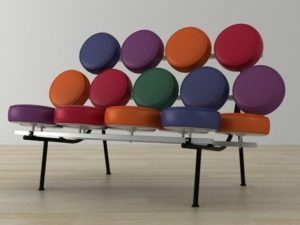 Designed by George Nelson in 1956, the Marshmallow sofa transforms the traditional sofa into a playful three-dimensional object with eighteen colored cushions connected to a simple steel structure. Because of the unusual shape and construction of the Marshmallow Sofa, it is one of the most extraordinary sofas in the history of design. The individual cushions are covered with a robust vinyl cover. When the Marshmallow sofa was introduced in 1956, the Herman Miller catalog described it as “The first of a series of pieces that embody a new concept in soft seating.” The warm personal and professional relationship between Nelson and D.J. DePree has produced an extraordinary range of products, from the playful Marshmallow Sofa to the first L-shaped desk, a precursor of today’s workstation. The playful Marshmallow sofa is a benchmark of modern design that continues to turn heads and make people smile. The 18 round cushions can all be the same color or in several colors for the right look in a private office, in a lobby, in a living room, in a living room or in a living room. Contemporary design for this additional cult object of design produced by the creative mind of George Nelson in 1955. This Coconut Chair, together with Marshmallow Sofa and the Pretzel Chair, enters the collection of the most famous sessions of twentieth century design history. It has entered the history of design, combining essentiality and comfort. Referring clearly to the coconut shell in fact, the Coconut Chair accompanied by a touch of humor is another creation of the ’50s by George Nelson. A decisive shape, for this armchair with a comfortable and relaxing seat, whose inspiration comes from a coconut cut into eight parts and with colors reversed with respect to the tropical fruit: white for the shell in plastic while the upholstery is available in various colors. The chair features a single piece of foam, upholstered leather cushions and a plastic shell on top of three chrome-plated steel base legs. The Coconut Chair can be used in large spaces, large halls of the hall, but also in the private residence as a couple in the living room, or individually arranged in the study room, a prestigious presence as well as a must in the history of design for connoisseurs. Which are the main features of Nelson’s style? George Nelson’s style can be described with the following words: simplicity, imagination, intuition. Over the course of forty years, Nelson produced a body of work, both on his own and in collaboration with a talented team of associates, that includes hundreds of furniture, building, exhibition, and graphic designs, as well as nearly a dozen books and over 150 magazine articles. Confidence in progress and growing economic prosperity were central aspects of the American lifestyle around 1950. Everything seemed possible, and everyone wanted to be “modern“. With the idea of bringing modern design into American homes, George Nelson created a wide range of everyday objects to furnish the home and the office, which embody the style of modern design: lamps, watches and other household accessories. Until the ’70s, Nelson’s studio continued to design many objects for the home, including the “Bubble Lamp” and the “Ball Clock“, which became icons of modern design of the 1950s. 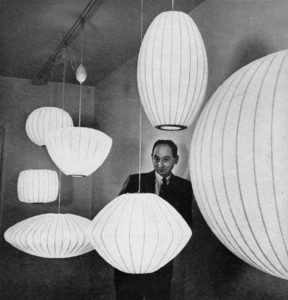 During the ’50s, George Nelson created for Herman Miller a series of lamps with a fluctuating shape: the Nelson Bubble.